If you have attempted repairs on your iPhone 3GS it is very easy to accidentally damage the connector socket for flex cable number 3 that is located on the 3GS logic board. Our in house service involves replacing the clamp bar connector on the iPhone 3GS logic board. The connector we replace is for the number 3 flex cable and the socket has a small plastic tab that flips up 90 degrees with light pressure. This allows insertion of the 3GS sensor flex cable. Once inserted none of the gold contacts should be showing, then pushing the plastic flap back down snugly onto the PCB allows the cable to be secured and function as intended. Symptoms of failure from physical damage to the socket include the earphone no longer working i.e. You can not hear callers, proximity sensor not working or the ambient light sensor or accelerometer failing to function as intended. * Our normal repair turnaround times are 3-10 working days. We always aim to complete repairs as fast as possible. 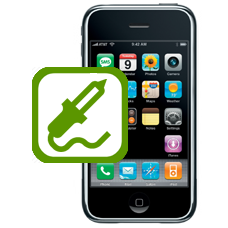 This is an in-house Apple iPhone 3GS repair service, when ordering this service you are required to ship your iPhone into our repair centre for works to be undertaken.